Recently when traveling it occurred to me that things have really changed. I can remember taking our kids on trips in the early nineties. The first thing on their minds after getting out of the car was to get into the swimming pool. There was always tremendous disappointment anytime they couldn't have a game of Marco Polo before bed. It was a great way for them to get exercise and burn off some energy after a day in the car. In the fifties and sixties, I can remember a swimming pool at a motel being heaven on earth. When we got a chance we lived in the pools. Being in the pool was part of summer, and often the only way to be in the pool was when you traveled. Once in while we might get out to play putt-putt if our skin was being to shrivel. Our kids got to swim more than we did growing up. We had local pools in both Halifax, Nova Scotia and Columbia, Maryland. When we came to Roanoke, we joined a country club, and the kids took part in the summer swim team ritual. Yet they still thrilled in finding a swimming pool when we were on the road. Today hotel swimming pools of any size have become dinosaurs. 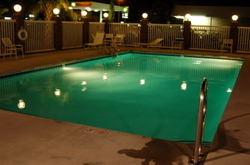 Yet on a recent trip to North Carolina's Crystal Coast, we found a great swimming pool. It was actually big enough to swim short laps. Much to our surprise we had the pool to ourselves one evening. The hotel certainly wasn't deserted, but the pool was. So where are all the kids? A guess a swimming pool on a hot day can't compete with an iPod? I have to say that things haven't changed for the better. When we book a hotel or an inn for a riding competition we always make sure the place has a proper pool. We've stayed at various Hampton Inns, Ramada Inns, Holiday Inn Expresses in Virginia this year and most recently the guest house at Maple Hall in Lexington, VA. All had nice big pools and when our girls and we were relaxing/playing in the pool other families were present also. One thing I've noticed is that families on average are smaller nowadays. I imagine in the fifties, each family at the pool might have had four or five kids a piece. Three families might have meant twelve kids in the pool at once. Nowadays, three families might mean only four kids in the pool at once. BTW, a landscape architect is coming to our place Thursday morning to begin working with us on the landscape and design of our future pool. Yahoo!